Story, George M.. "Shawnadithit". The Canadian Encyclopedia, 23 January 2019, Historica Canada. https://www.thecanadianencyclopedia.ca/en/article/shawnadithit. Accessed 25 April 2019. 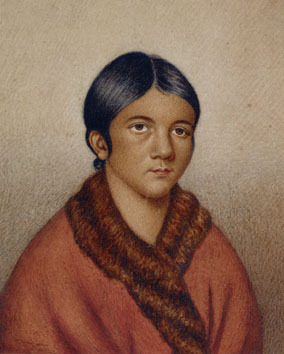 Shawnadithit (also known as Nance or Nancy April), the last Beothuk (born circa 1800-6 in what is now NL; died 6 June 1829 in St. John’s, NL). Shawnadithit’s record of Beothuk culture continues to shape modern understandings of her people. In 2007, the federal government announced the unveiling of a Historic Sites and Monuments Board of Canada plaque recognizing Shawnadithit’s importance to Canadian history. Sick and starved, the Beothuk died out in 1829 with the death of Shawnadithit. While some claim that the Beothuk escaped total extinction by marrying into other Indigenous nations, such as the Mi’kmaq, these theories do not negate the legacy of Shawnadithit as a record keeper of Beothuk history. In the 1820s, a Scottish explorer took the skulls of Demasduwit and Nonosbawsut, as well as what were likely related burial items, and brought them to Edinburgh, Scotland, where they were eventually housed at the National Museum of Scotland. Indigenous peoples, notably the Mi’kmaq, in association with the Canadian government and the Newfoundland and Labradorgovernment, have made attempts to repatriate the remains. In January 2019, National Museums Scotland reached an agreement with the federal government to arrange for the transfer of the remains back to Canada. In April 1823, Shawnadithit, her mother and her sister, all starving, were captured by English furriers at Badger Bay and taken to St. John’s by merchant and magistrate John Peyton Jr. There, the women were supposed be placed under the care of Governor Charles Hamilton. However, he was in England at the time of their arrival and, because the women were in poor health, Captain David Buchan, who was acting on Hamilton’s behalf, decided to release them, after first ensuring they received medical attention. Given gifts to present to their people — peace offerings — Peyton left them at Charles Brook, located on the western side of the Bay of Exploits and north of Exploits River. Shawnadithit and her family searched but could not locate any surviving Beothuk in the area. During this time, the health of Shawnadithit’s mother and sister worsened. They soon died, likely the result of complications from tuberculosis. All alone, Shawnadithit was taken into the home of John Peyton Jr. at Exploits, where she worked as a household assistant for five years. It was there that English settlers renamed her Nance or Nancy April. In 1828, Shawnadithit was brought to the Beothuk (then spelled “Boeothick”) Institution in St. John’s, an organization formed the year prior as a means of protecting what remained of Beothuk culture. Listening to Shawnadithit speak about her people, the institution’s president, William Eppes Cormack, recorded valuable information about the language and customs of the Beothuk. (See also Indigenous Languages in Canada.) 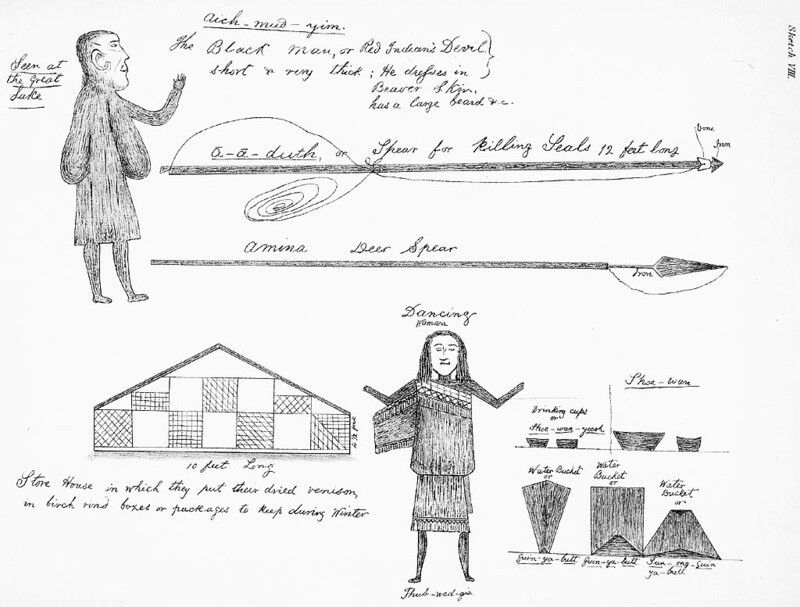 Shawnadithit also drew valuable sketches of Beothuk settlements, tools and people, as well as maps of territory. (See also Indigenous Territory.) Her record remains some of the only information about the Beothuk. 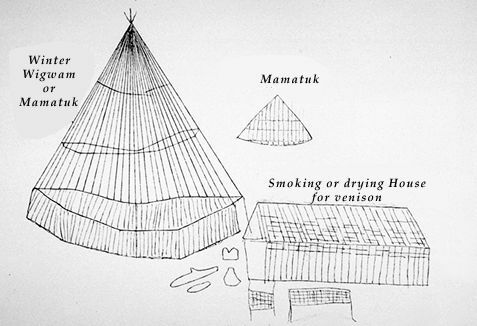 Drawn by Shawnadithit, these images represent a variety of subjects relating to traditional Beothuk life (circa 1800 to 1829). Sick with tuberculosis, Shawnadithit died on 6 June 1829. She was buried in a cemetery in St. John’s. Her skull was sent for scientific research to London, England, where it is believed to have been destroyed during the Second World War. Ingeborg Marshall, A History and Ethnography of the Beothuk (1996) and The Beothuk (2001). James Patrick Howley, The Beothucks or Red Indians: The Aboriginal Inhabitants of Newfoundland (1915). Donald H. Holly Jr., “A Historiography of an Ahistoricity: On the Beothuk Indians,” History and Anthropology vol. 14, no. 2 (2003). DRAWINGS BY SHAWNADITHIT Explore Shawnadithit’s drawings on this site and read about their depictions of Beothuk life. BEOTHUK HISTORY This site provides access to the full text of James Patrick Howley’s study on the Beothuk people, originally published in 1915. PROVINCIAL HERITAGE Heritage Newfoundland and Labrador provides information about the disappearance of the Beothuk. DICTIONARY OF CANADIAN BIOGRAPHY Read more about Shawnadithit and the Beothuk in her biography on this site.